I love using our all in one CuteZCute sandwich cutter. It is so easy to use, easy to clean and I am sure this bento lunch will put a smile on my son's face. Recently he has been asking me to include a LunchBox Love note daily with his lunch which I try to remember. The nice people over at sayplease.com recently sent me several additional boxes of Lunchbox Love notes and I love reading them myself. 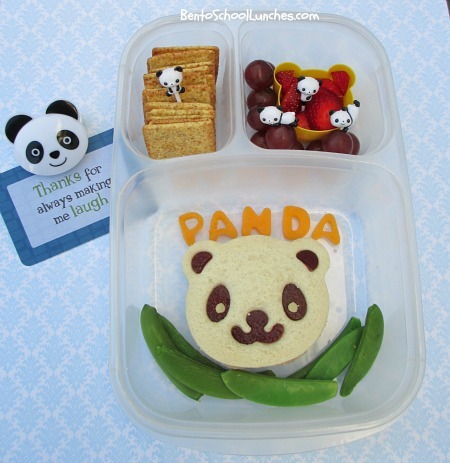 Panda shaped ham and smoked gouda cheese sandwich using CuteZCute sandwich cutter. Inserts for eyes, nose, ears are organic fruit leather and pupils are from smoked gouda cheese. Blanched sugar snap peas and mild cheddar alphabets. Seedless red grapes and strawberry slices. Packed in EasyLunchboxes container. Panda clip for LunchBox Love note is from dollar section at Target. Here are the supplies or similar that I used to make this lunch. Those panda picks are adorable! Cute lunch! Thanks so much Ming and glad to know you like the note too! Super cute, and smoked Gouda is one of my favorites! This is sooo pretty! Love it!